Looking for a fun and easy science experiment for kids? 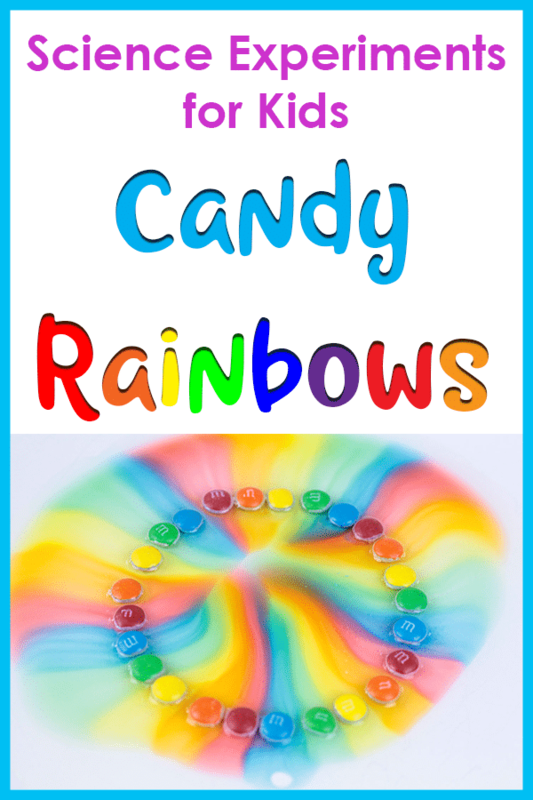 Use candy to conduct science experiments with kids at home or in the classroom. They will have fun making patterns and watching the colors. 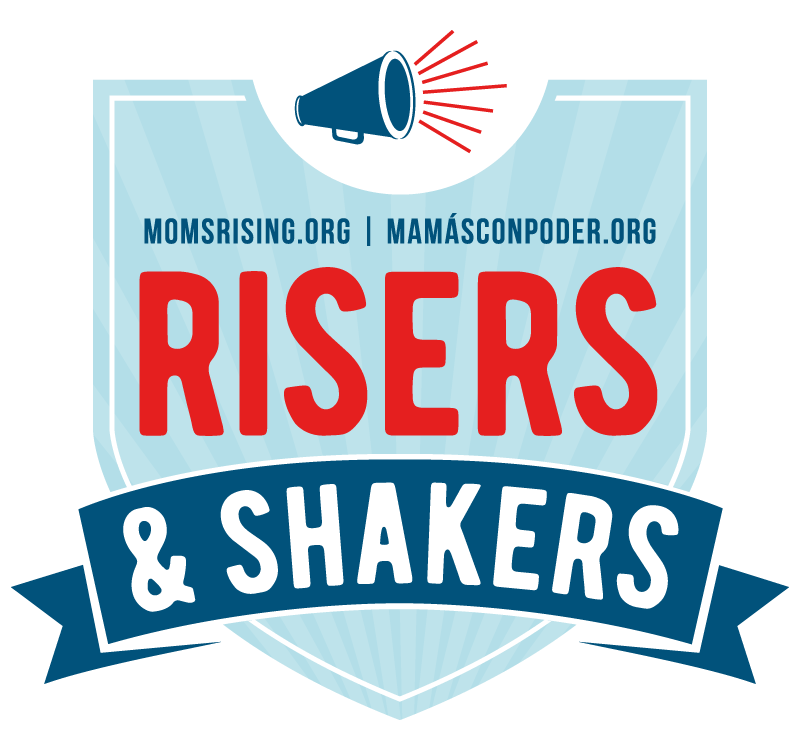 This activity is perfect for preschool children! If you have leftover candy from a previous holiday, don’t just throw it out, do candy science experiments instead! 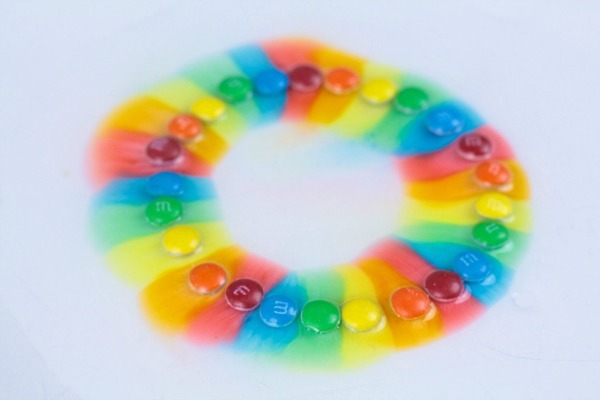 Use old M&Ms to create a beautiful and colorful candy rainbow using science. Kids will love doing this experiment over and over again. 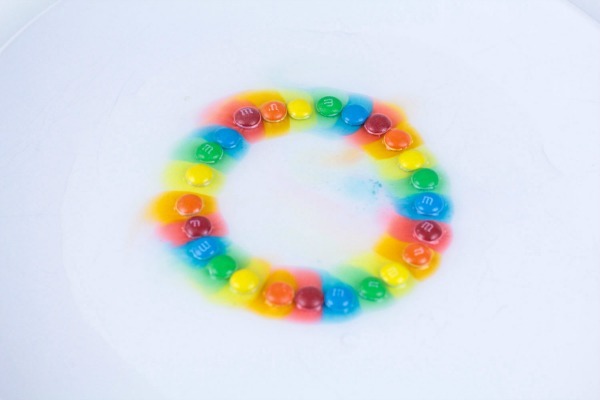 There is no end to how much fun you can have with this simple science activity. 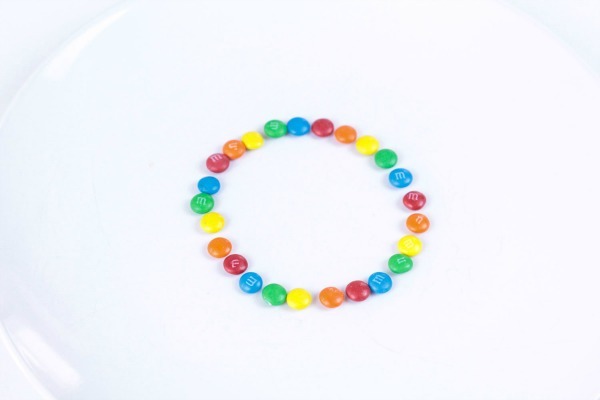 Spread M&Ms out into a circle shape in the middle of the plate. You can experiment with trying different shapes, multiple layers of candy, and placing the candy in different locations on the plate. We went with a classic circle because you can’t beat how pretty the circle rainbow looks! Get some warm water from the tap. 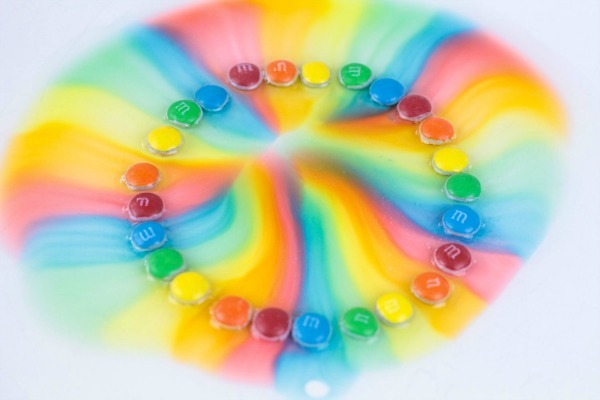 Carefully pour a thin layer of water under the M&Ms. Pour just enough water to cover the bottom of the plate. Watch as the colors spread across the plate. The most fascinating thing about this experiment is that if you don’t bump the plate or table, the colors will stay in their own lanes. It makes a colorful rainbow but does not mix. 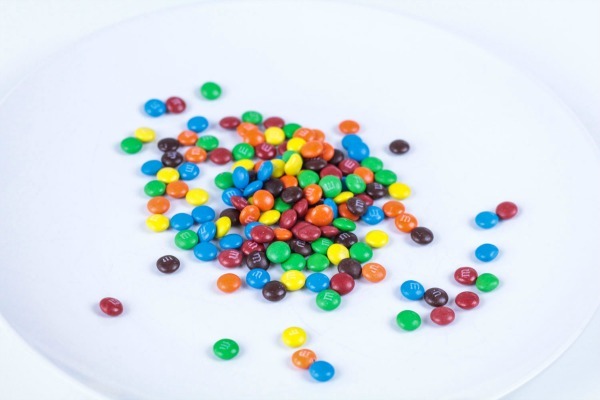 This happens because the M&Ms dissolve quickly (as they are made to “melt in your mouth”) but they won’t mix unless you bump the plate. Bumping the plate will quickly turn the pretty rainbow colors into a brown mess, so watch out! If you have a whole bag of M&Ms, repeat this experiment several times and use color different patterns! Before you start, ask your kids to identify the different colors of M&Ms. You can also have them practice fine motor skills by sorting them. Work on patterns by starting a simple color sequence, such as red-green-red, and have them continue the pattern around the plate. Practice counting how many candies fit on the plate. Ask preschoolers what shape the candies make. Ask them what they think will happen when the water is poured onto the plate? Let them experiment with candy placement and water pouring. Do they get the same results each time? We love simple science experiments for kids because they are easy to set up while offering plenty of learning opportunities. 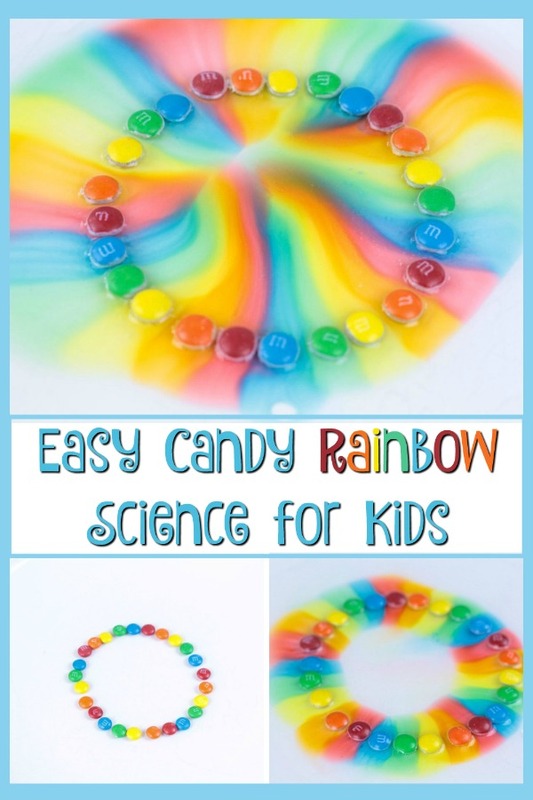 This M&M Rainbow Science Experiment is perfect for a preschool science unit or just for fun at home! This really is so cute and fun! My six year old will love this!